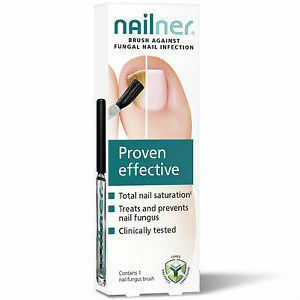 Nailner is a product that treats nail fungus. It comes in three different and convenient application options: spray, brush, and pen. Nailner claims to work in just a matter of weeks, due to its specialized formula that saturates the nail and works continuously throughout the day. What’s It Really Made Of? The active ingredient in Nailner is Ethyl Lactate. This is a solvent that is found naturally in products such as wine or chicken, and has been proven effective in treating fungal infections. Since it is a solvent, it dissolves into the nail and continuously works to get rid of fungus in a natural and harmless way. The user must use Nailner differently depending on his or her preference of application. The pen and the brush require the user to completely cover the nail with each application. The spray should be applied evenly about 10 – 15 cm away from the nail. However, the dosage for each option is the same. The user should apply the solution to the nails twice a day for 3 – 4 weeks. After 4 weeks, the user can apply once a day for the entire re-growth of the nail, which is about 6 – 8 months. This is a long application time and can seem daunting. However, Nailner will get rid of fungus early on, and as the nail grows back — if applied for the entire 6 – 8 months — will ensure that fungus doesn’t grow back. There is no indication that this product will produce side effects for the user, as the formula is natural and non-toxic. No adverse reactions have been reported. Will Nailner Repair Brush Cure Nail Fungus? Because Nailner requires you to use it for the entire regrowth of the nail, it is effective in producing long-term results, and will work to cure the fungus. It’s natural formula has been clinically tested, and users report good ratings after using Nailner. Nailner can be bought in select pharmacies and from Amazon.com for approximately $40.00. This will last for 300 applications. However, it is a European product and therefore is limited in availability. For this reason, Nailner is not an affordable option, and is difficult to obtain. Nailner is a natural product, produces no side effects, and has long-term benefits. However, the 6 – 8 month treatment time, the lack of availability in American markets and pharmacies, and the expense make it unaffordable and unattractive to most users. Jack Stevens	reviewed Nailner	on April 29th	 and gave it a rating of 3.